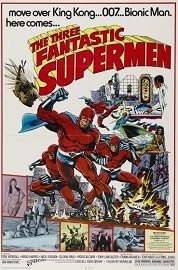 The first film in the long running 3 Fantastic Supermen series. Brad Harris stars as an FBI agent who enlists the help of two other agents, Tony Kendall and Nick Jordan, donning red bullet-proof tights, utility belts and suction cups to walk up walls and fight crime. Their mission is to go after a criminal mastermind (Jochen Brockmann) who is duplicating gold bricks and printing counterfeit money. Later, the evil doctor even creates clones of the Supermen themselves. Features incredible stunts performed by Nick Jordan. Also with Gloria Paul. (Includes the original U.S. trailer). Nick Jordan (aka Aldo Canti) was a Roman stuntman at Cinecitt� studios who gradually became a minor leading man in a few Italian B- films. He was reportedly linked to the Italian underworld and was found murdered on January 21st, 1990, at Rome's Villa Borghese park. This film came from a very rare Greek import print in very nice picture quality and is the best English language version currently available anywhere.